If you're staying around Paddington, you probably think Hyde Park is the only place nearby for some green outdoors. But this run will teach you otherwise. 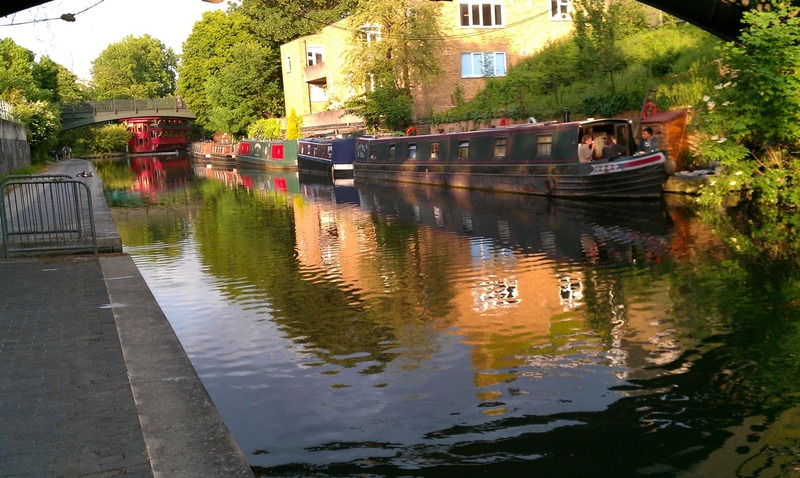 Beginning right behind Paddington Station, you can experience a great run along the Regents Canal, with water, landscaped canal-banks and wonderful old narrowboats lining the way. And then, for a total contrast, take a loop through Camden Town, London's most bizarre neighborhood and hip evening spot, and cut through Regent's Park on the way back. Sound interesting? Then, let's go! When I said that the route starts right behind Paddington Station, I REALLY meant it. You literally need to walk through the station, along the platforms for the Heathrow Express, then go up the stairs or the ramp at the back of the station, at the entrance for the Circle Line underground. 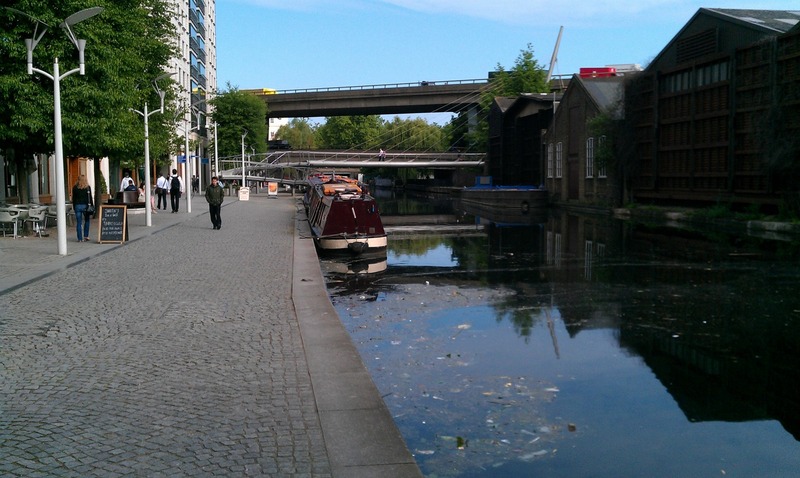 But instead of going into the tube station, go to your right along the walkway to Paddington Basin, just 20 steps to the right. 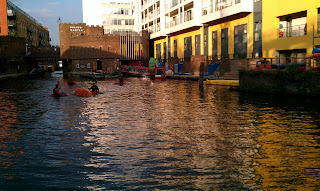 You will soon be standing there with a canal in front of you and a lot of new office development all around. Just turn left, and off you go. The water will be directly to your right. 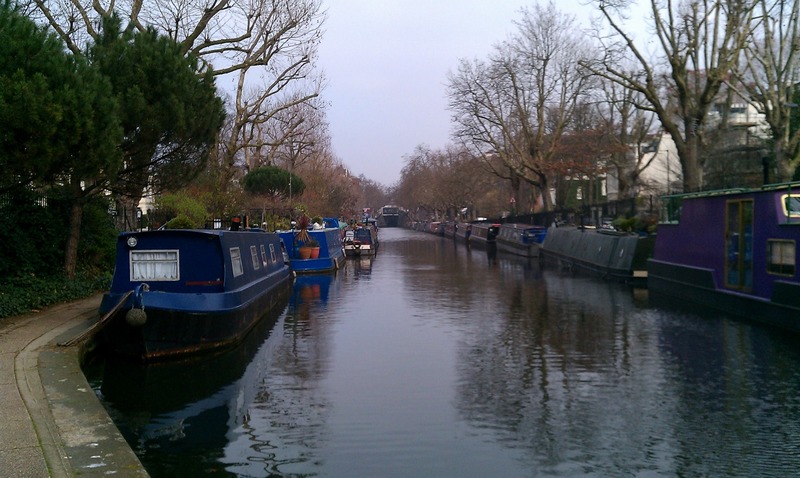 After just a few blocks, you'll come to the first highlight of the run: Little Venice. This is one of my favorite spots in London, a triangular stretch of water lined with narrowboats on 2 sides. Narrowboats are the old canal boats built to be able to pass each other on the canals, whose heyday started eclipsing already back in the 1850s, when the railroads began spreading throughout England. Now the boats are used as houseboats, tour boats and excuses for endless restoration projects. 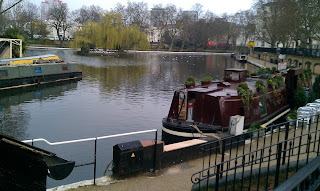 There's even a little café in one of the boats at Little Venice. What a hangout. Cross the bridge to the other side of the canal, then turn right to run along the north bank of the canal from now on, with the water still on your right side. This is the old towpath. In the old days, men and horses were hitched to the barges, and pulled them from the towpath. After a few blocks, at Aberdeen Place, the canal goes into a tunnel for a couple of blocks. Just run straight ahead along the street overhead, until it makes a sharp left turn, with a brick wall in front of you. Right at the turn, there is a gate in the wall: go through it and down the metal stairs and you are on the towpath at the water again. There is a big narrowboat basin here. The canal goes under a few bridges ahead, the least scenic part of the canal, but then the world becomes quiet and green after entering Regent's Park. The canal forms the northern boundary of the park, curving around its north side. At first there are some big mansions lining the way. Later, it goes by the London Zoo, and the bird aviary is right next to the path, with storks, egrets and peacocks lining your way. After another boat mooring and a sharp left turn, the canal enters the Camden Town area. 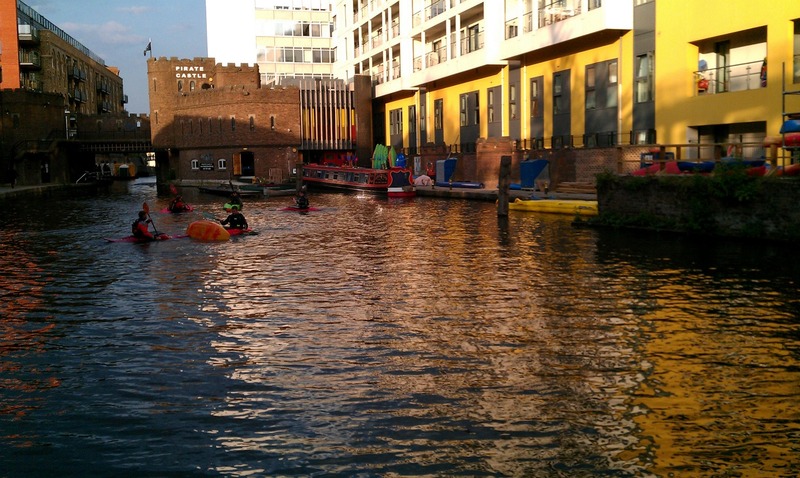 Many more people will be using the towpath, and water-sports people paddling kayaks are often out having fun at the Pirate Castle rowing club. 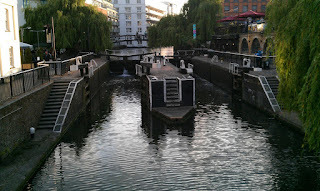 At Camden Locks -- a working, manually operated boat lock -- the path crosses over a bridge to the other side. 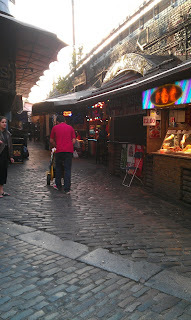 Just before the bridge, turn left, into the courtyard of the Camden Market. This wonderful (but touristy) place is worth a walk-through. 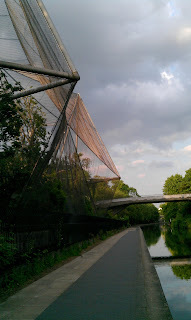 NOTE: For a route along the eastern section of Regents Canal, see the Victoria Park route listed above! Continue out the back of the courtyard into the little lane, Camden Lock Place. From here, you'll find the main entrance into the covered part of the market. Make sure you go through it: the giganic statuary and creative touches are amazing. The building used to be a stables, hence horse statues all over the place. In just a couple of blocks, you'll pass the Camden Town tube station on the left and then come to a big intersection. 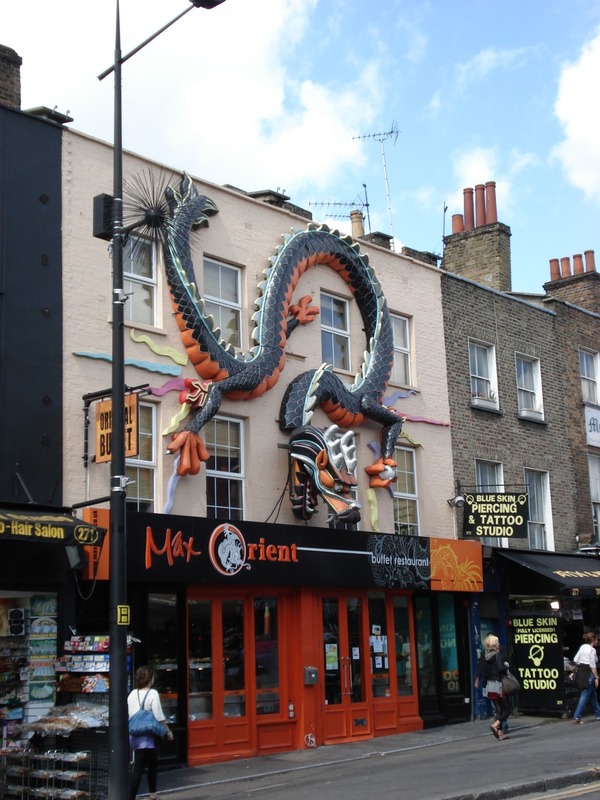 All the interesting shops on Camden High Street end here. So turn right here on Parkway, another lively street, going past the London Jazz Venue club and and Odeon cinema and other restaurants, pubs and clubs. If this street doesn't give you ideas on how to spend this evening, nothing will. Keep running straight. In just 4 blocks you'll run straight into the side of Regent's Park. You could turn right there to get back to the canal, but to see something different, we'll cut straight across the park and connect with the canal on the other side. 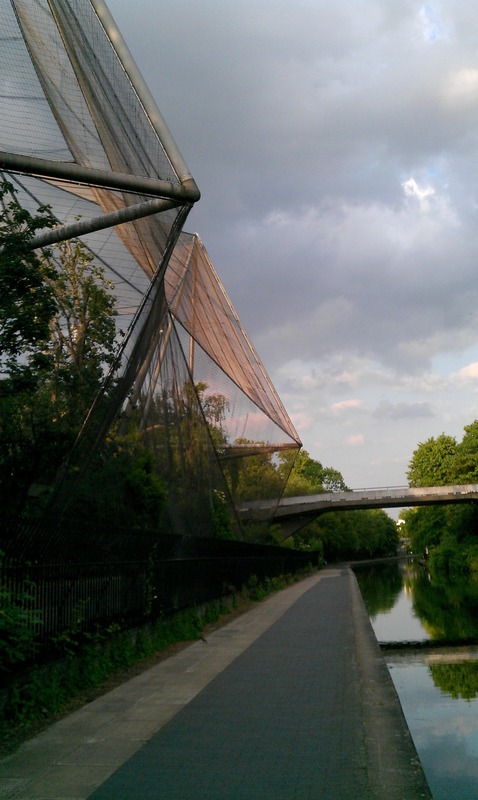 NOTE: If you're interested in seeing more of this great park, see the Regent's Park Route. When you cross the Outer Circle road and enter the main part of the park, take the path that goes off diagonally to the left. This heads towards a small gothic-styled monument and then straight on across the athletic fields towards the central mosque and its minarette at the far side of the park. On nice afternoons and evenings the fields are full of happy players: there's cricket, soccer, rugby and a surprising amount of softball. 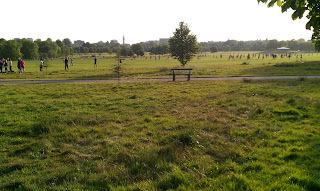 After the athletic fields, the path edges the park's boat-rental pond and then you'll exit Regent's Park on Hannover Gate, going past the mosque on your right side. The street ends at Park Road in one block, where you turn right and run a block to the canal, where you descend to the towpath and run back to Paddington. Now that was something really different! Glad you can put it into your run, Cookie. Enjoy those beautiful canal paths! Staying in Islington recently I had a run on Regents Canal stretch from Angel to Victoria Park. Wonderful run, early in the morning with just runners and bikers. Be careful under bridges, especially in the dark. But seeing the dawn while running the canal is absolutely amazing. I haven't ever tried the canal through East London, Gianni. Sounds like a great new route!